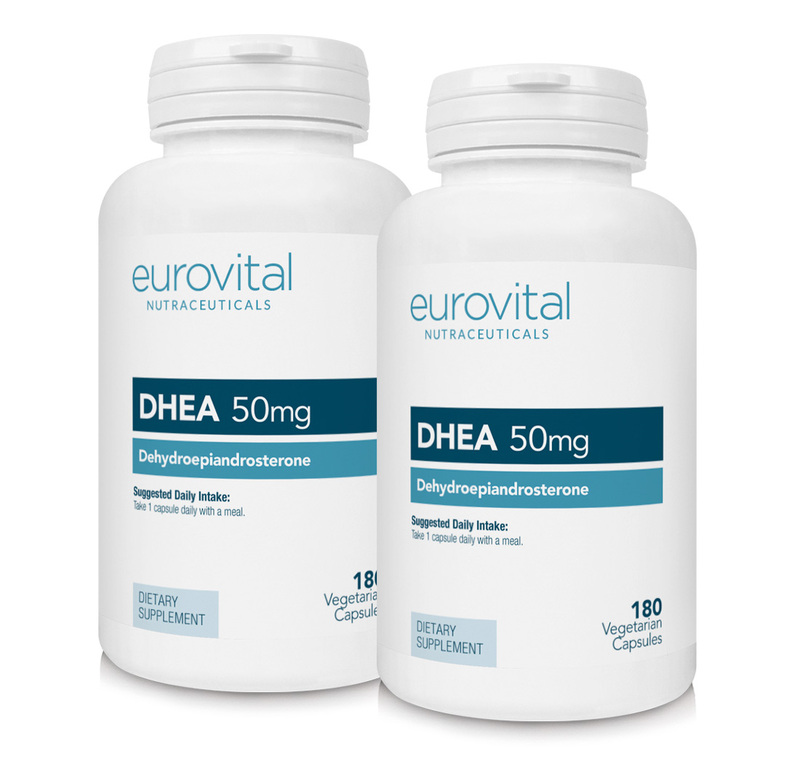 DHEA is a hormone produced by the adrenal gland and is the most common sterone in the human bloodstream. When we are young, around 7 years of age, we begin producing this hormone naturally. Blood levels reach their highest during our late teens and begin to decline around age 25. DHEA levels decline at the rate of about 20% per decade until we eventually bottom out at approximately 10% of peak levels by the time we reach 80 years of age. DHEA’s most overlooked but vital role may be its relationship with cortisol. DHEA has an inverse relationship to cortisol, i.e. when DHEA is low cortisol levels are elevated and vice-versa. Cortisol is one of the few hormones that increases with age. Cortisol is known to induce stress and when levels are elevated for long periods many bodily functions are negatively affected. For example, the body may become more insulin resistant and damage to the endocrine system via damage to the hypothalamus may occur. Maintaining healthy DHEA levels while keeping coritisol levels under control may help slow physical ageing and reduce stress. What Scientific Studies support DHEA? In the 1960s, French physician Etienne Emile Baulieu, M.D., discovered DHEA's anti-ageing properties. In a recent study, an endocrinologist at the University of California, San Diego, Samuel Yen, M.D., administered DHEA supplements to thirty men and women ages 40-70 for six months. The subjects felt substantially better physically and psychologically, and they had fewer aches and pains. C. Norman Shealy, M.D., Ph.D. has said that DHEA plays a major role in the immune system, is a building block for sexual and other hormones, and determines general levels of well-being and mood. DHEA is deficient in every major disease, including obesity, diabetes, high blood pressure, various immune deficiencies, coronary artery disease and autoimmune disorders. DHEA May Have A Significant Impact On Lean Body Mass. In one study conducted by D. Jakubowicz and colleagues, 22 men took 300 mg of DHEA nightly for 30 days. They observed an average 27% fall in insulin levels. They also found an 89% increase in IGF-1 (a powerful hormone with multi-faceted effects, most notable its growth hormone-like effects on body composition), a 14% decrease in body fat, and a 7.8% increase in lean body mass. DHEA May Block Cortisol’s Catabolic (Breakdown) Effects On Muscle Tissue. Other discussions at the DHEA conference centered on the Cortisol - DHEA relationship. Cortisol is a catabolic (tissue breakdown) inducing stress hormone. Exercise has been shown to significantly raise serum cortisol levels. These exercise- induced, elevated cortisol levels may contribute profoundly to catabolic effects on muscle tissue. DHEA has been shown to block some acute effects of stress induced cortisol release. DHEA May Have A Profound Influence On Positive Body Composition Alteration Favoring Lean Muscle Tissue Accrual. Yet another study revealed that high dose DHEA supplementation decreased body fat levels by 31% while maintaining the same overall body weight in just 28 days. This indicates a significant increase in lean body mass at the expense of body fat. This study shows DHEA may have a profound ability to significantly alter body composition to favor lean mass accrual.